Greek contact with Roman culture begins with the colonization of the southern portions of the Italian peninsula and the eastern coast of Sicily in the 8th century B.C. This period of Greek colonization corresponds roughly to the time that the first settlements on the Palatine and surrounding areas were coalescing into a unified town. The migration of so many Greek colonists will give the name Magna Graecia to these parts of Italy and Sicily. While Rome at this period will be influenced by direct contact with the Greeks in the south, a major, though indirect, conduit for Greek influence will be through Roman interaction with the Etruscans, the more sophisticated, urbanized culture to the north of Rome, which had begun to spread its reach throughout the Italian Peninsula. Among the many debts Rome had with Etruscan culture was the divine triad Tin, Uni, and Menvra, who would be assimilated into their Roman counterparts, Jupiter, Juno, and Minerva, and they would be worshipped together in the great temple of Jupiter Optimus Maximus (509 B.C.). As Rome grew and began to extend her power into southern Italy and Sicily, direct contact with Greek culture increased. Finally by the middle of the 2nd century B.C. Rome had subjugated Greece itself. The conquest of the second century brought unprecedented wealth and prosperity to Roman coffers and opened the floodgates to direct cultural exchange. Rome would never be the same. Livius Andronicus, a Greek slave from Tarentum brought to Rome, would produce the first Latin tragedy and comedy. He was also responsible for bringing into Latin an adaptation of the Odyssey. It is not much of an exaggeration to say that Roman mythology is to a very great extent Greek mythology. A great impetus for the assimilation of Greek mythology into Roman culture was the lavish expenditures to beautify the cities of Italy, and in particular Rome. Through temples, fora, basilicas, arches, and other public monuments, the political and social ideology of the republic, and later of the empire, was communicated through the decoration of urban monuments, often using themes and figures drawn from Greek and Roman myth. Augustus and his successors would employ a great deal of myth to foster a growing cult of the emperor. The divide between mortal and immortal would gradually diminish, as the emperors became deified and seen as divine representatives on earth. This cult of emperor worship, foreign to Roman sensibilities, would spread from the eastern Mediterranean, which had become used to seeing figures like Alexander as gods. Greek mythology would also be used in mosaics, paintings, and luxury items throughout the Roman world. These decorative items served to proclaim the status, erudition, and refinement of the people for whom they were commissioned. By far the most important conduit for the assimilation of Greek culture and mythology was literature. And among the many great figures in Latin poetry who borrowed from Greek culture, none comes close to Ovid in sheer volume of his work, the inventiveness of his mind, or the breadth of his use of Greek myth. Many legends are associated with local heroes and heroines, often in conjunction with a local hero-cult. Some legends attracted folktale elements and spread beyond their original region, as the legends of Theseus of Athens and Bellerophon of Corinth. Other legends owe their preservation to the visual arts or handbooks of classical mythology, such as Apollodorus’ Biblioteca or Library of Greek Mythology (2nd century A. D.) and Hyginus’ Genealogiae (2nd century A. D.). By far the most important source for the transmission of Greek mythology is the poetry of Ovid. 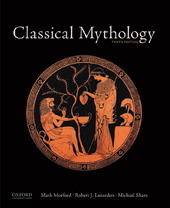 His most important works for the student of mythology are the following: Amores (five books of elegiac poems which contain many allusions to myths and legends); Heroides (fifteen letters from mythical women to their lovers); Fasti (six books of a planned 12 book work, which celebrate the Roman religious calendar); Metamorphoses (an epic poem in fifteen books which serves as a virtual compendium of Greek and Roman myths and legends). Hero and Leander. These were two cities on the shores of the Hellespont: Sestos on the European side and Abydos on the Asiatic side. LEANDER [lee-an'der] of Abydos loved HERO [hee'roh], priestess of Aphrodite at Sestos. Hero would swim the straits each night to visit her. One night a storm put out the light that she placed in a tower to guide him. He drowned, and when Hero discovered his body washed up on the shore she fell to her death from the tower. Cydippe and Acontius. On Ceos CYDIPPE [seye-dip'ee], or KYDIPPE was loved by ACONTIUS [a-kon'ti-us], or AKONTIOS, who left an apple for her to pick up inscribed with the words: "I swear before Artemis only to marry Acontius." She bound herself by reading the words out loud and eventually married Acontius. Flora and Zephyrus. Flora [flo'ra] was the goddess of the flowering plants (including grain and the vine), and was said to be the consort of Zephyrus [Zeh'fi-rus] the West Wind, who gave her a garden filled with flowers, like the Hyacinthus and the Narcissus, and tended by the Horae (the Seasons) and Graces (Greek Charites). Pomona and Zephyrus. Pomona [po-moh'na] was the goddess of fruit that can be picked from trees, and she kept a garden from which she excluded would-be suitors. The Etruscan god Vertumnus [ver-tum'nus], whose name perhaps means“changer” or “turner” from the Latin vertere (“to turn” or “to change”), turned himself into an old woman who advised Pomona to marry Vertumnus. To persuade Pomona he tells the unhappy story of Anaxarate and Iphis. When he resumed his usual form as a young male god, she accepted him. Ceyx and Alcyone. CEYX [see'iks], or KEYX, king of Trachis, and ALCYONE [al-seye'on-ee], or ALKYONE (daughter of Aeolus), called themselves Zeus and Hera and were punished by being turned into seabirds. Ovid is more romantic: in his story Ceyx was drowned during a sea-voyage and told Alcyone of his death in a dream. She found his corpse on the seashore and in grief changed into a seabird (the mythical halcyon is sometimes identified with a kingfisher), while Ceyx came to life also as a seabird (perhaps a tern). When the halcyon sits on her eggs afloat on the sea, her father, Aeolus, forbids the winds to blow. Atalanta and Milanion. Atalanta, the daughter of the Arcadian hero. Iasus, was nurtured by wild animals, she, too, was a huntress. Ovid narrates that the suitor who could win a foot-race against her would win her as wife. Those who lost were killed. After many suitors had failed, MILANION [mi-lan'i-on], also called HIPPOMENES [hip-po'me-neez], dropped three golden apples (a gift from Aphrodite) one by one during his race, which he won because Atalanta stopped to pick each one up. Anaxarete and Iphis. In Cyprian Salamis lived ANAXARETE [a-naks-ar'e-tee], who scorned her lover, IPHIS [eye'fis], and showed no pity even when he hanged herself before the door of her house. As she watched his funeral procession pass, she was turned into stone and became the cult-statue of Aphrodite at Salamis, called in Latin Venus Prospiciens (Venus the Watcher). Iphis and Ianthe. On Crete lived another IPHIS, daughter of Ligdus and Telethusa. Her mother disobeyed the order of Ligdus to expose the baby girl and deceived him by dressing Iphis as a boy, whom Ligdus betrothed to IANTHE [eye-an'thee]. Telethusa prayed to Isis to pity the lovers, and the goddess turned Iphis into a boy, and he and Ianthe were married. Baucis and Philemon. BAUCIS [baw'kis or baw'sis], or BAUKIS and his wife PHILEMON [fi-lee'mon] were a pious Phrygian couple, who unwittingly entertained Zeus and Hermes in their cottage. The gods rewarded them by saving them from the flood with which they punished the other Phrygians for their lack of hospitality. Their cottage became a temple, of which they were the priests, and their prayer that they be allowed to die together was answered when they simultaneously were turned into trees, an oak and a linden. Byblis and Caunus. BYBLIS [bib'lis], daughter of Miletus (eponymous founder of the city of Miletus), revealed her love for her brother, CAUNUS [kaw'nus], or KAUNOS. He fled, followed by Byblis, who out of exhaustion melted into a fountain. Byblis and Thisbe are the names of fountains in Asia Minor, also . Pyramus and Thisbe. THISBE [thiz'bee], like Byblis, is the name of a fountain in Asia Minor and PYRAMUS [pi'ra-mus] or PYRAMOS is one of the major rivers of Cilicia, although Ovid sets the legend in Babylon. Pyramus and Thisbe were lovers, who lived next door to each other but were forbidden by their parents to meet or to marry. The talked through a crack in the party-wall and arranged to meet at the tomb of Ninus, outside the city. Thisbe came first and fled when a lioness, her jaws bloody from a recent kill, came to drink at the nearby fountain. She dropped her veil, which the lioness mangled. Later Pyramus recognized the veil lying there and assumed that Thisbe had been killed. He killed himself, just as Thisbe returned to find him dying. She in turn killed herself, and the fruit of the mulberry tree, under which the tragic deaths took place, turned from white to black as a memorial of their deaths.